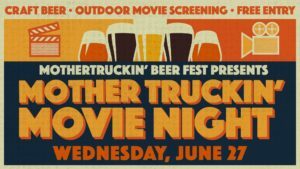 MotherTruckin’ Beer Fest Presents MotherTruckin’ Movie Night at the Village Green across from Sears Centre Arena. Bar opens at 6PM and movie starts at sundown (approximately 8:30PM). We’ll be screening Top Gun starring Tom Cruise.